I am delighted to see a business targeting the UK’s SME as positively and effectively as Marshall Volkswagen Bridgwater. The SME market has grown strongly in recent years, especially micro-businesses and I’ve regularly championed the opportunity for dealers to look at this area, distinct from traditional fleet sales because they are very different. The Federation of Small Business reports that there were 5.7 million private sector businesses at the start of 2017; 2.2 million more than in 2002. Small businesses accounted for 99.3% of all private sector businesses at the start of 2017. Of these, 76% did not employ anyone aside from the owner(s). Yet all too often, motor retailers still think of business users as being ‘fleet’, which is a very different type of customer. For me, Matt Robertshaw’s approach to LCV sale is entirely appropriate. 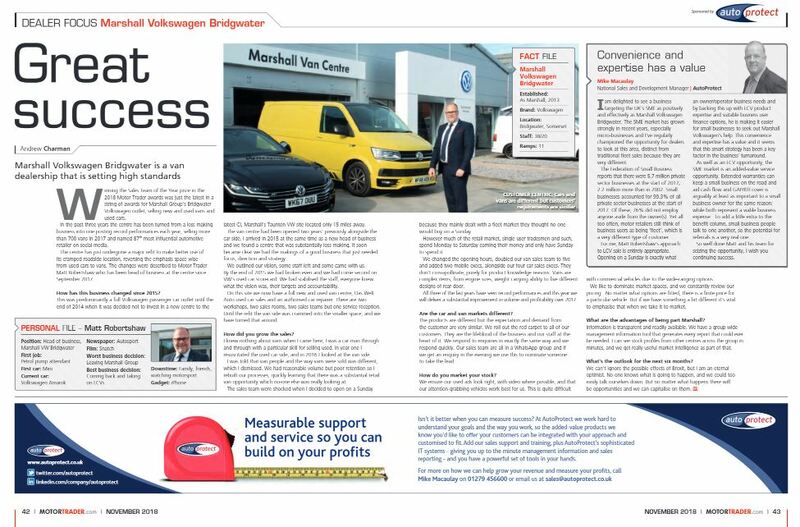 Opening on a Sunday is exactly what an owner/operator business needs and by backing this up with LCV product expertise and suitable business user finance options, he is making it easier for small businesses to seek out Marshall Volkswagen’s help. This convenience and expertise has a value and it seems that this smart strategy has been a key factor in the business’ turnaround. As well as an LCV opportunity, the SME market is an added-value service opportunity. Extended warranties can keep a small business on the road and aid cash flow and GAP/RTI cover is arguably at least as important to a small business owner for the same reason; while both represent a viable business expense. To add a little extra to the benefit column, small business people talk to one another, so the potential for referrals is a very real one. So well done Matt and his team for seizing the opportunity, I wish you continuing success. NGN Hellas is ISO certified for Risk Assessment and Underwriting Services. Autoprotect Hellas – APH is the trading name of NGN Autoprotect Hellas Ltd that is licensed in the Hellenic Republic as an Insurance Broker and is authorised and regulated by the Hellenic Private Insurance Supervisory Committee (Bank of Greece) in respect of insurance intermediation activities Company Reg. No: 144502103000, Athens Chamber of Trades Reg No:368802 Broker License No: 363 TIN: 800901050 D&B D-U-N-S Number: 498981821. NGN Autoprotect Hellas Ltd is a member of the Hellenic Insurance Broker Association (HIBA) and its members are members of the Chattered Insurance Institute (CII) and the Chartered Institute of Loss Adjusters (CILA).